When a large county combined seven departments under a single, consolidated agency, it needed to integrate the data created, stored and accessed by its 6,000 employees located across more than 30 county-wide offices. The county’s objectives were to eliminate redundancies, reduce overhead and facilitate cooperation between departments. 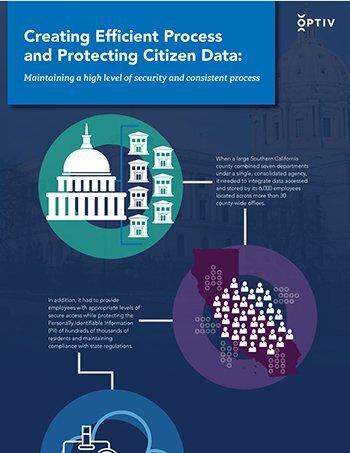 Optiv helped the agency provide employees with appropriate levels of secure access while protecting the PII of hundreds of thousands of residents and maintaining compliance with state regulation, and you can see how it all happened in this infographic.